You know the cliché: “Never judge a book by its cover.” But with Rubel Shelly’s book, it’s really hard not to give in to this! 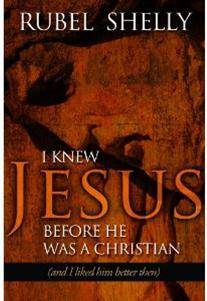 The complete title is I Knew Jesus Before He Was A Christian… And I Liked Him Better Then. Provocative, huh? His idea is that the Jesus that is presented in the Bible — which is also the Jesus that is presented to someone who doesn’t have a personal relationship with Him — is different from the Jesus people see in the organized church and in professing Christians. The Jesus in the Bible (or before someone becomes a Christian) is seen in freedom and abundant life. But the Jesus in the church (or after someone becomes a Christian) is a rule-keeping killjoy. Honestly, I expected this book to be a church-bashing book. I excepted Rubel Shelly to come out blasting away on the rephrase I-love-Jesus-but-I-can’t-stand-His-followers! So I was more than pleasantly surprised right from the first chapter — appropriately titled “Pro-Jesus and Pro-Church” — that this book was not taking that track. Instead, Shelly makes the distinction between “institutionalized religiosity” and a vibrant personalized relationship between God and mankind. Then out of the overflow of this personalized relationship with God, a Christian’s outward lifestyle toward others should be notably more Christ-like. This book is not targeted at any one segment. There are parts that every pastor would do well to heed. Then there are other parts that anyone who calls themselves Christian should read. And there are even parts that those not involved in a church or a relationship with Christ should take note of. If, by the title, you were expecting to see the church get beat up, you will be sadly disappointed. However, if you feel like the Church has no room for improvement, you will not only be disappointed, but probably a bit angered too! On the other hand, those who love Christ and love His Bride (the Church), and want to see the Church operating more as she should, you will find much to process in this book. I am an ACU Press book reviewer.